Please Note: There is a three month minimum rental during the winter months. Absolutely no damage to the building or grounds from Hurricane Irma!! Large oceanfront condo. View overlooks beach. Two bedrooms, two full baths, air conditioning, washer and dryer, large exterior lanai (porch). This condo is on the first floor, directly looking at the beach. The beach is only about 50 steps away, along with a huge swimming pool. There are no steps to climb. This is very convenient when bringing in or out your coolers and beach chairs. Approximately 60 minutes from Disney World, Sea World, Universal Studios and all of Orlando's magical attractions. Plus, just 10 minutes away from space shuttle launches via the Kennedy Space Center. Please check the Availability Calendar below before requesting reservations. The beach is fantastic! Also, a great place to stay before or after a cruise, as Port Canaveral is just about 2 miles away. The rocket launches from the Kennedy Space Center are amazing to watch from the beach! Not needed, as you will be on the ground floor. Located less than 5 minutes from the Cruise Ships located at Port Canaveral. Less than 60 minutes from most all theme parks. Couldn't ask for a better location. Very clean , spacious & well equipped condo. Steps away from the beach & pool & very quiet. Located next to all the resturants on the water & less than 1 hr from Disney. Dwayne was great to work with, very accommodating. We are definitely returning next year! Again we had a wonderful month at Canaveral Sands. Everything we need and excellent location as well. Marleen and family so helpful. Only complaint is time goes so fast. Had both adult children down and trip to Orlando airport is so easy. All neighbors are so nice and also we can have our little Westie, Maddie come too! Wonderful Property, Great for our Family! Marleen's condo is awesome! We had everything we needed and more that we expected! The fantastic beach and having a pool so close was a big bonus for our family. With great restaurants, peacocks, a rocket launch and Kennedy Space Center, we couldn't have had a better week. Thank you! The unit was clean, comfortable and so nicely appointed. The kitchen was outfitted with everything from spices, to baking dishes to lovely dishware. We really appreciated having a washer and dryer and the owner's thoughtful array of cleaning supplies -- it means a lot when you are vacationing with two kids and a dog:); we always like to keep things as we would in our own home, and Marleen and Dwayne made that so easy. 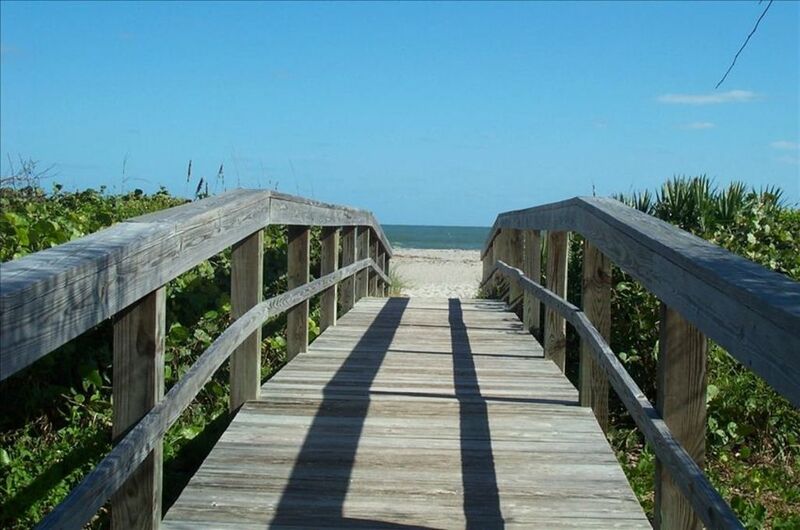 We loved staying just steps away from one of the most lovely beaches in Florida; gated beach access was especially nice. The kids said their beds were very comfortable, and the master bedroom was spacious and outfitted with a nice tea table, great for writing and reading. Though we never once turned on the tv, there were flat screen tvs in both the living room and the master bedroom. The location of Canaveral Sands is just terrific, and we felt very safe and welcome. Having our small dog with us meant so much, and there were with plenty of places to walk him; residents and neighbors alike were very friendly and welcoming, to us and our pooch. We could not have been happier, all the way around, so much so that we hope to return next year! I also must add that I mixed up our arrival date by one day (very unlike me), but the owners could not have been more gracious or helpful in accommodating us. Thank you so much, Marleen and Dwayne! Can't wait until next year! I highly recommend this family-friendly, wonderful rental!! Wonderful, perfect for our family! This condo was superb. I came down with my two boys, 6 and 10, who spent a week at "space camp" at the Kennedy Space Center. My husband joined us later in the week. One of the most important things to me when renting is cleanliness, and this condo was great. Very clean! I loved having two bedrooms so the boys had their own room, and their own beds! My youngest son is a "tornado" in bed so they would not be able to share a bed. It was actually difficult to find a condo with a second bedroom with two twin beds, on the ground floor, on the beach! Originally this condo was not available the dates I needed because the owners themselves were possibly going to have family coming. However, Marlene was great to work with and it turned out she did not need the condo so we were able to book it. The beach is so close, literally steps from the patio of the condo. The outdoor shower was so nice to be able to wash off sand and not worry about getting sand in the condo. The beds were very comfortable. Bathrooms well stocked with soaps and toilet paper. The kitchen had everything needed for cooking and cleaning. Having a washer and dryer was even better than I expected. The condo is decorated beautifully, and has a welcoming "feel" to it. I highly recommend this condo. The owners were wonderful to work with and the condo itself is beautiful. If we ever have a chance to go to Cape Canaveral again, this is definitely the place we want to stay! Very nice condo in front of the beach and close to shopping, restaurants, etc.! We really enjoyed our stay. Hope we can go back again soon! A minimum three month rental required between December and April. Rental agreements over six months have a significant reduced tax rate of 6.5%.